The United Kingdom has been a very place for Muay Thai especially over the past weekend with Super Show Down and the England versus Portugal event barely in the books as complete. Barely over a week later Semtex gym of the UK will stage another Muay Thai event with at least the main event promising some pleasing fight fire works to come. 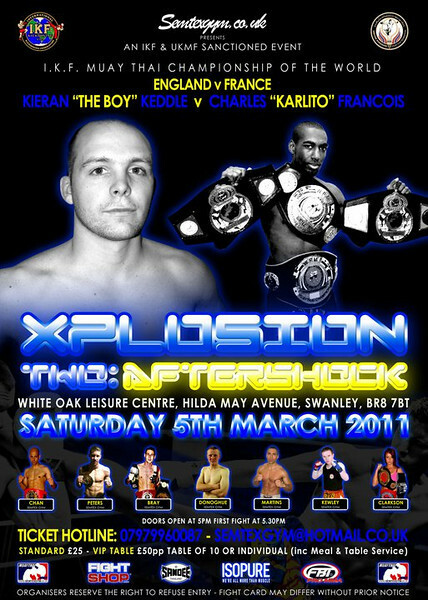 Kieran Keddle of the Semtex gym in the United Kingdom makes a much anticipated return to action on the Semtex promoted Xplosion 2: aftershock card. Semtex gym will be hosting Keddle’s opponent in standout French nak muay, Francois “Karlito” Charles, a recently crowned World Professional Muay Thai Federation (WPMF) champion. Charles won the WPMF championship against countryman Alexandre Boyance at 66 kg. Both fighters in the main event are very decorated fighters though Keddle has been inactive lately focussing instead on building his business and working at Semtex gym. Kieran Keddle is also the first ever Englishman to win in Lumpini against a Thai opponent. Charles competed in the Queens Birthday event in Thailand in 2009 where he made a good account of himself. Charles also participated in King’s Birthday in 2009 where he also fought and won. The remainder of the card is still being filled out but expected to participate are many of the Semtex gym notables such as Hayleigh Jane Clarkson, Women’s English ISKA 57 kg champion and Darron Chan an IKF Southern champion. ~ by fatsoking on February 21, 2011.